Join Kurt Johnson on his travels through the former Eastern Bloc. 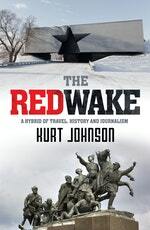 Spurred on by an obsession with the old Red World, in his hybrid of history, travelogue and journalism, The Red Wake, Kurt Johnson travels to the far reaches of the former USSR. From frozen corners of Kyrgyzstan to the ex-KGB headquarters in Moscow; from a rocket launch on the Kazakh Steppe to an unrecognised gangster state in Moldova; from the irradiated ruins of Chernobyl to a gulag in Siberia – Johnson traces how the great political experiment of the 20th Century still weighs heavily on our world today. Via this interactive map, you can schlep around with Johnson as he takes in the sights and mingles with the locals. A hybrid of history, travel and journalism.